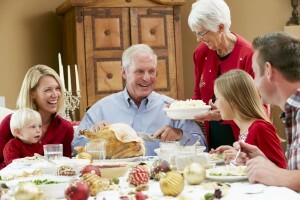 Despite what you may think, you aren’t destined to gain weight this holiday season. Here are some tips and tricks to help you mange the season without losing sight of your health and fitness goals. Don’t skip meals. Skipping breakfast or lunch just to “make room” for that big dinner you’re planning or party you’re attending is a recipe for disaster. If you go hungry, you’re more likely to overeat when the time comes to chow down. Start your day with a healthy breakfast, avoid grazing throughout the day, and when you do eat a meal, eat slowly and chew your food well. Eating too quickly will lead to overeating. Plan ahead. If you’re headed to a holiday gathering, come up with a game plan so you’ll know just what you will and won’t eat before you arrive at the party. Fruits and vegetables are great fillers and can help you resist the temptation to indulge in fattening party foods. Watch your portion sizes. Use a small plate when going through the buffet line and fill it with mostly fruits and veggies so you’ll fill up on healthy foods and have less room for sweets. Stay hydrated. Many drinks, such as soda and alcohol, contain “empty” calories that won’t satisfy your hunger. Reduce your daily caloric intake by drinking plenty of water—at least 64 ounces per day. Water will help curb your cravings for high-calorie, fatty foods. Use the “buddy system.” Never attend a holiday party alone. Take a friend or family member with you—someone you trust to hold you accountable and help keep you distracted from the food table. Make time for exercise. Even if you can only fit in 10 minutes here or there, aim to get at least 30 minutes of physical activity every day, whether you’re traveling or at home. Exercise will help burn those excess calories you may consume, but it will also help keep your holiday stress levels in check. If you want to have a happy, healthy holiday season, regular exercise is a must. Don’t let holiday parties, office potlucks and Christmas feasts get to your waistline. Use these tips and tricks to help keep your holiday season healthy.